The face rising is triggered by a specific phrase on the Diyode IRC channel. We have a server in the shop that runs our access control system, including a bot that hangs out on the IRC channel so that it can post workshop events to the IRC, and collect to-do items and meeting topics from the chat room. The bot can also speak Text-to-Speech phrases with an IRC command. 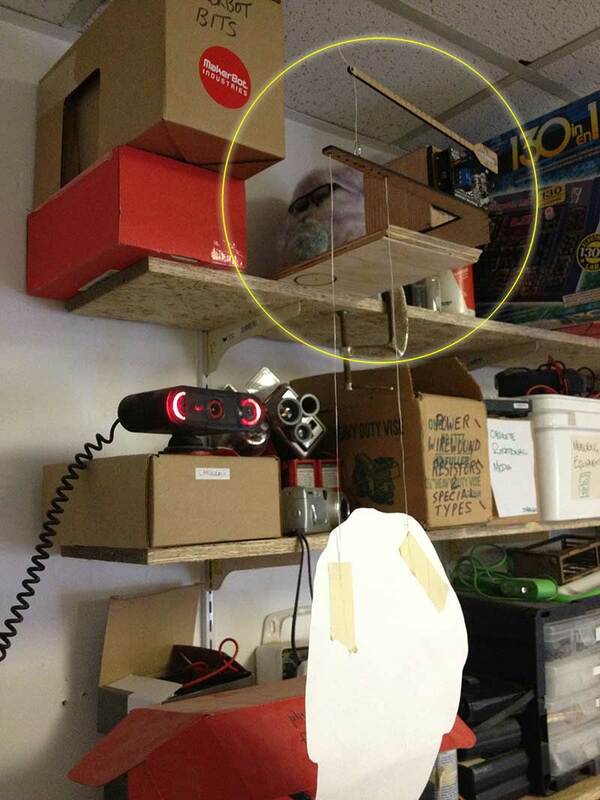 The prank was to attract attention to the Diyode webcam on IRC (“Hey, someone just entered the shop without the doorbot noticing”), and then trigger a face to appear right in front of the cam while everyone was watching. For the face, I chose the disturbingly brilliant Jackson Blankenship. A specific phrase spoken on the IRC channel would trigger IRC python script on the linux box to send a message over USB to the arduino above the camera. Then the servo on the codeshield would make the face rise slowly in front of the webcam, then drop back down, freaking the crap out of anyone watching. The photo above shows the arduino/codeshield on a wooden block above the webcam. Three laser-cut arms control the face rising (I tweaked the design a bit after I took the photo). Here’s the .ai file for laser cutting the arms. Particularly useful for the cut-out of the servo setting, if you’re doing something similar with sg90 servos. print "there are no arduinos attached"